When we first launched the original Timberwolf frame, one of the first questions was “when will it be available in .45 ACP or 10mm?” That time is now, because we’ve revamped and upgraded the design to bring you the Timberwolf Large. The first thing you’ll notice is that the TWL fits in your hand like a much smaller pistol - in fact we measured the grip circumference of the most popular factory 9mm service pistol, and the Timberwolf Large was only .007" larger. That’s only the width of a couple of human hairs, giving you real .45 ACP or 10mm firepower in a 9mm sized package. The TWL is available in two grip lengths: full and short. Both grip lengths accept G20/G21 Gen3 and Gen4 slides, as well as G40/G41 slides. 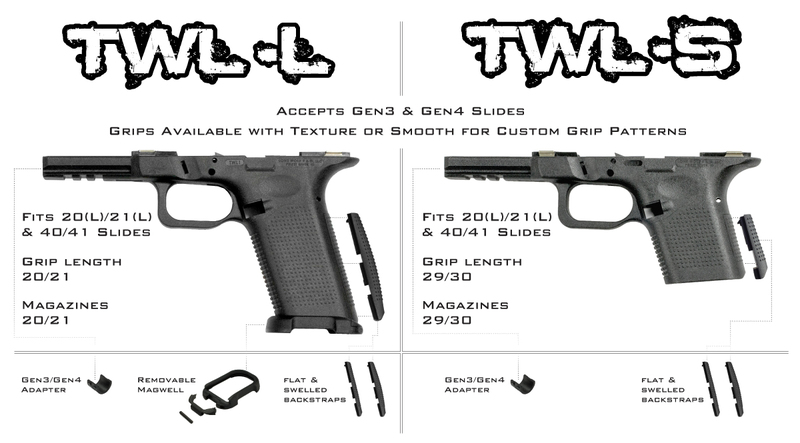 The TWL-Full uses G20/G21 magazines, and the TWL-Subcompact uses G29/G30 magazines while still using a G20/21 slide. Both grips are available with our grip texture, or smooth so you can add your own stippling! When using a Gen4 slide you simply remove the installed adapter in the dust cover area of the frame. Using Gen3 slides you leave the adapter in place to fill the gap between the slide and dust cover. The Timberwolf Large is available in multiple configurations, all of which include the dust cover adapter, removable magazine well, and interchangeable backstraps. Short grip frames do not have magwells included. No matter what your shooting goal is, the Timberwolf Large will fit your needs. Whether you want a gun for backwoods carry, a longslide for hunting, a slim and easy to carry .45 ACP for personal protection, or just want to build the coolest gun at the range, the Timberwolf Large can make your dreams come true. Years in the making, the Timberwolf Large is here. The frame game will never be the same. Looking to add a custom laser engraved texture to your smooth frame? See here. *When checking out please put the name, city, state, and phone number of the FFL you want the frame shipped to in the comments section. Must ship to FFL (Lower ships to FFL, any other upper parts ship to customer) - FFL items are not returnable.